Superior engineering - built to last! Our top of the line Clothesline Pulley Kits are a superior engineered product that will not rust. Our pulley clothesline kits come complete with everything needed to install a heavy duty pulley clothesline along with full installation instructions. Clothesline tighteners are included with each kit to keep the line taut. Best part is, the pulley's are equipped with permanently lubricated silent action ball bearings to allow the pulley to be free spinning which means no hassles in keeping things spinning smoothly. Our clothesline pulleys have clothesline wire guides which ensure the clothesline wire does not escape the pulleys. While the small kit holds the clothesline spreader on the clothesline wire, the medium and large kits include a docking bracket that holds multiple clothesline spreaders in place by the pulley so you can release them as needed. The pulleys also have a non-pinch finger guard as a safety feature. Guaranteed to be the Absolute Best System or Your Money Back! We know first hand that cheaper pulleys are not only cheaper in price, but also much cheaper in quality and lacking most features available on our pulleys. 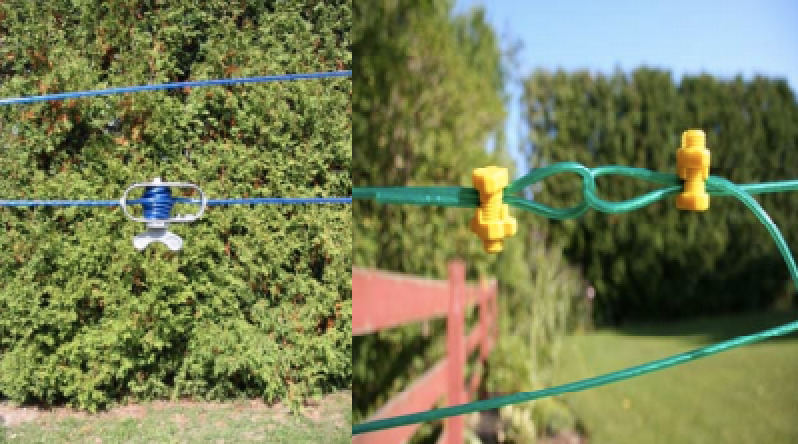 Our pulley clotheslines have a durable design that is built to last. These solid pulley's perform like no other and since they are permanently lubricated, there always ready to get the laundry done. That's right, enjoy smooth sailing from here on out without having to worry about lubricating oil on your laundry. Our pulley clothesline kits are great for all climates and perform well in coastal and salty air areas. The ball bearings are the smoothest and longest spinning. The Deluxe Pulley Clothesline Elevator works great for long garments and bedsheets as it offers an easily adjustable height of up to 4 feet. This also gives you the ability to raise the clothesline when not in use. The size you choose doesn't have to fit your drying space exactly as the clothesline wire can be cut to size using a good wire cutter. A pulley clothesline makes it easier to hang washing. There’s no need to walk up and down the clothesline and the laundry basket can be left in one spot. A pulley clothesline will allow clothes to dry more quickly due to the more open area and greater exposure to sun and wind. A pulley clothesline can be longer and stronger. Good for large heavy bed sheets (a retractable clothesline will break under heavy loads). A pulley clothesline can have the opposite pulley setup at a high spot to dry loads out of reach from children and pets. The clothesline is usually mounted at arms length so it's relatively high. Once installed, the pulley clothesline is designed to be up permanently as it takes some time to mount it properly and tighten the line. Be sure to check out our Clothesline Guide for more information on clotheslines! Click here for the Deluxe Pulley Clothesline Elevator Instructions! 1. Choose two parallel points that will provide enough space for your desired drying space. Try to pick a spot that is relatively flat solid surface and open. If attaching to your home, be sure to locate the studs to ensure your clothesline is fully supported. 2. 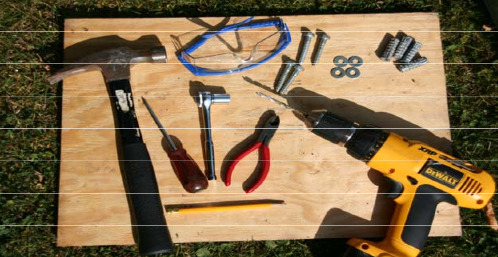 Tools Needed – A hammer, Pencil, Drill, Wire cutters, Punch. 3. Depending on how you would like the clothesline, choose either a comfortable position to hang your clothes or the highest point you can reach. When mounting the opposing pulley make sure it is approximately two feet higher than the top of the other pulley. This will reduce the amount of sag. If you are using the clothesline elevator, the opposing pulley will need to be at least as high as the highest setting on the elevator. 4. Mark with a pencil where you would like the clothesline pulley installed. 5. Mark using a punch or nail then Drill a ¼” x 2 inch holes. 7. Complete steps 4, 5, and 6 with the opposing pulley. 8. Connect the clothesline wire and tighten the line with the Clothesline Yellow Joiner Tightener or Mini Winch on the lower line as it is easier to join and tighten on the lower line, as pictured below. Before loading laundry, the clothesline tightener should be placed at the pulley where laundry is loaded and should be the first item that goes out followed by your laundry. 9. The Clothesline Spreader will hold the 2 lines together allowing the upper line to help support the weight on the lower line. The Clothesline Spreader should be released from the pulley where laundry is loaded after approximately half the laundry is hung on the line. (More than one divider may be necessary depending on the length of the line or the weight of the clothes). Hanging your clothes neatly will increase the speed of drying and reduce wrinkles. Use a damp cloth to clean the clothesline (every time you use it). Beats all of our wildest clothesline dreams!! There is not much to say, This is one of the best designed, best made, best priced things I've purchased in the last ten years. You cannot go wrong with their products. The pulley kit arrived quickly. I had a small problem with my order, but I was promptly and politely taken care of. The customer service was second to none. I have not had a chance to install this American made pulley kit yet, but I can tell by the construction of all the components that it should last many years. As the owner of an industrial equipment installation company, I know quality components when I see them, and these certainly qualify. LOVE LOVE LOVE MY CLOTHESLINE! When I was younger my aunt had a pulley line and I finally found what I wanted 34 years later. When I ordered it the company said they no longer made the model I wanted but would substitute the new more expensive one at no additional charge. I use it every week. Extremely durable and easy to use. I installed a 50' line a few weeks ago and have been using it everyday since. It was quick to install and moves smooth. I had to oil the spacer in the middle to stop squeeking. I just wish I had more space for more pulleys. 50' line holds one load of my extra large capacity washer. love the huge pulleys with bearings in them, love the distance. I put up 80 foot clothesline. Would like to coment,but have not installed yet.